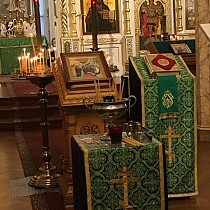 On the great feast of the Entry of the Theotokos to the Temple, Tuesday, December 4, with the blessing of Metropolitan Hilarion of Eastern America & New York, divine services in St. Alexander Nevsky Diocesan Cathedral in Howell, NJ were led by Bishop George of Canberra, vicar of the Diocese of Australia & New Zealand. 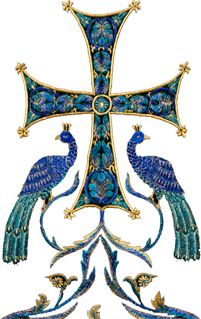 On this feast, the parish sisterhood celebrates the anniversary of its founding. His Grace was co-served by cathedral clergy: Archpriests Serge Lukianov (dean), Rafael Melendez, Boris Slootsky & Seraphim Chemodakov, Priest George Kaplanov, and Protodeacons Leonid Roschko & Paul Drozdowski, as well as Archpriest Leonid Goferman (rector of Holy Virgin Protection Church in New Brunswick, NJ). 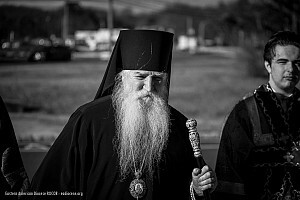 At the Little Entrance, with the blessing of Metropolitan Hilarion, Bishop George awarded Fr. Leonid Goferman the right to wear the palitsa. At the conclusion of the Liturgy, Bishop George greeted the faithful with the feast and congratulated members of the parish sisterhood, presenting them each with a bouquet of flowers. On December 8-9, the 25th Sunday after Pentecost, Divine Liturgy was celebrated in St. Alexander Nevsky Cathedral by two hierarchs: Bishop Irenei of Rockland & Western Europe and Bishop George of Canberra. The archpastors were co-served by the above-mentioned cathedral clergy. Singing at the Divine Liturgy was the cathedral choir under the direction of Alexandra Lukianov. Many faithful communed of Christ’s Holy Mysteries. After Liturgy, the hierarchs were given an official welcome, with Bishop Irenei receiving congratulations on his recent appointment to the Diocese of Western Europe. In commemoration of his visit, Bishop Irenei was presented with an icon of the Holy Right-Believing Great Prince Alexander Nevsky and a two-volume Menaion of the Holy Fathers of the Kiev Caves. Greeting Bishop George, there was a palpably joyous feeling amongst the parishioners, who were able to pray with the former vicar of the Eastern American Diocese. A painted portrait of Bishop George, donated by Holy Cross Monastery in West Virginia, was presented and will hang in the Diocesan Center among other portraits of past hierarchs of the Diocese. A festal luncheon in honor of the hierarchs’ visit was held in the parish hall.